Scientists working in British Columbia have uncovered the fossils of a small Cretaceous-era pterosaur, showing this extinct flying reptile came in travel size. Pterosaurs are an extinct group of flying reptiles that were extremely well adapted to flight. Most featured impressive wingspans, extending to between 13 to 36 feet (4 to 11 meters). Incredibly, the largest pterosaur was the size of a giraffe, boasting a wingspan of a small plane. But the recent discovery of a tiny, cat-sized pterosaur in British Columbia shows that these flying reptiles also came in a pint-sized version. A new study published in Royal Society Open Science describes a rare, small-bodied pterosaur that had a wingspan measuring just 5 feet (1.5 meters). That’s smaller than some condors and pelicans. The newly described pterosaur was pieced together from just a few fragments, including a humerus and several fused vertebrae. 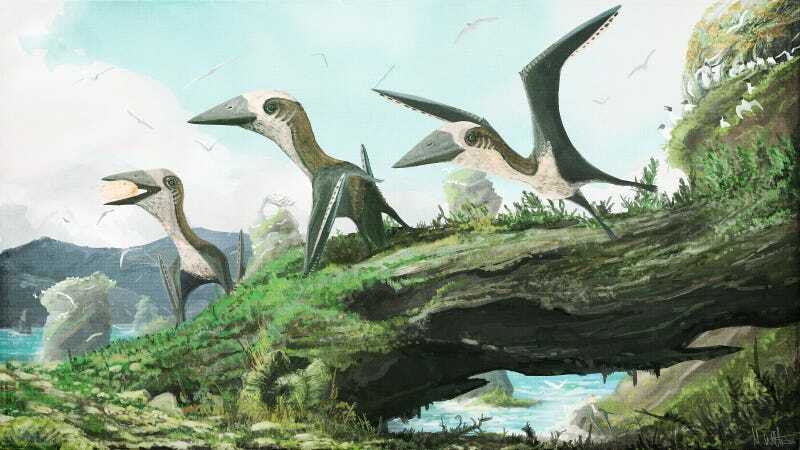 The researchers, led by Elizabeth Martin-Silverstone from the University of Southampton, categorize it as an “azhdarchoid” pterosaur—a group of short-winged and toothless flying reptiles that represented the final phase of pterosaur evolution. Image: Martin-Silverstone et al. 2016. The new study shows that flying reptiles were more diverse than previously thought, and that small pterosaurs hadn’t yet been outcompeted by birds during the late Cretaceous some 100 to 66 million years ago. It adds to a growing body of evidence showing that this era wasn’t dominated by large or giant species, and that smaller pterosaurs were well represented during this epoch.